The dwarf Pugglemud had one true love: gold. Ungers and giants—none of these mattered to Pugglemud, for he was willing to risk any danger to get his greasy hands on everything that glittered. Kendra Kandlestar and her companions first encountered Pugglemud while on the way to the Castle of Krodos to find the Box of Whispers. The Eens weren’t sure if they could trust the dirty and ill-mannered dwarf, but they needed his help to cross through the desolate marshlands. Pugglemud helped them reach the castle, but abandoned them as soon as he discovered the gold he was after. This was not the last of Pugglemud that Kendra was to see, however. When she journeyed to the underground kingdom of Umbor, Kendra was to find that Pugglemud had assumed an important position among the dwarves. 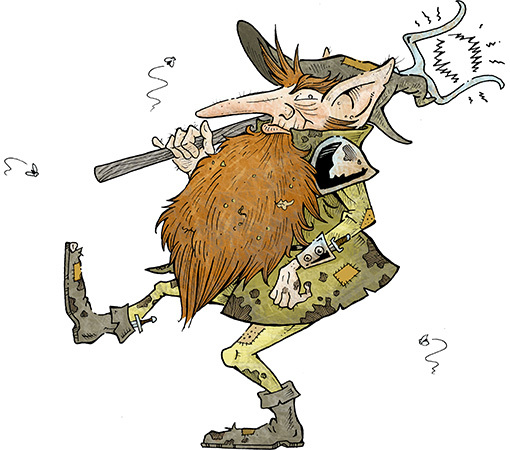 Pugglemud tried to betray Kendra and her friends, but lost everything—his power, his position, and even his trousers—when the Een girl freed the army of slaves that were working in the dwarven mines. Pugglemud was once again able to land on his feet and Kendra was to stumble across the dwarf for a third time while traveling across the Seas of Ire to the fabled Rumble Pit. Pugglemud had assumed yet another identity—and devised a new scheme to earn the precious gold he so loved. Unfortunately, that scheme came at the expense of Kendra and her friends. Pugglemud also played an important role in the war that erupted between the monster tribes, serving as a bounty hunter and spy.